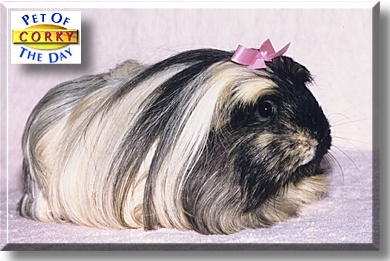 When we first adopted Corky four and a half years ago, she looked like a short-haired cavy and we were told she was a boy! She was just adorable but so petite! Her eyes were so small like a mouse! Soon after adoption we realized she was not a he and, also to our surprise, her hair was growing and growing and growing! She was a Peruvian! We never had a Peruvian cavy before and, when people saw her picture, they thought she was a puppy! Corky is a perfect little girl! She is so sweet and likes to snuggle on our laps, lick our hands and she especially likes being rubbed under her chin! We can even pick her up and turn her on her back and rub her chin! She never bites even when we have to give her long hair a bath and trim! Her favorite food is fresh spinach and her shrill whistle will be our alarm if we re running late feeding our cavies their twice-daily veggies! She listens to everything and looks up when she hears us talking about her! If we are tending to one of our other cavies, (they are each in separate twenty-gallon aquariums), she gets slightly jealous and impatient for attention! Corky is a perfect pet.